The Impact STS-MT Mastertop Shooting Table is ideal for large product photography, ecommerce shooting, still lifes, art objects or food. At 24 x 51" there is room for multiple products and vertical objects without seeing the top of the shooting surface. 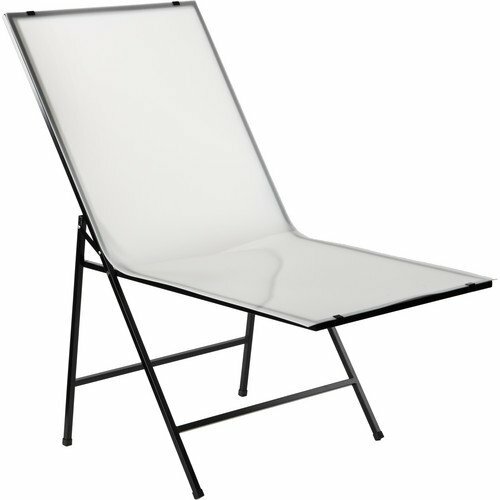 Folding legs integrated into the design elevate the glossy translucent Plexiglas sheet 19" allowing you to backlight it and light from underneath as well as from the front. The shooting table sets up and breaks down quickly - simply slide each end of the Plexi under the tabs built in for that purpose and start shooting.